Come forse sapete, io non butto via nemmeno i piccoli scarti di cartoncino e li uso per tagliare tante forme, che poi metto da parte nelle bustine trasparenti dei CD, per usarle quando ho poco tempo. Ma ormai ne ho tantissime e così, quando voglio fare una card e ho fretta (ultimamente sempre!! ), non trovo mai quello che mi serve: perdo molto tempo rovistando nella scatola dove ho messo le bustine... Idem per le timbrate con i sentiment. Purtroppo però non ho trovato le buste con tasche grandi e con dimensioni diverse... :( Allora ho pensato che con il Fuse Tool avrei potuto crearmi da sola tutte le buste con tasche che volevo... e delle dimensioni adatte a raccogliere forme piccole e grandi. Ci vorrà parecchio tempo per ri-organizzare tutte le mie fustellate in un raccoglitore con tasche di diverse dimensioni, divise per tipo, ma credo che durante l'estate ce la farò. 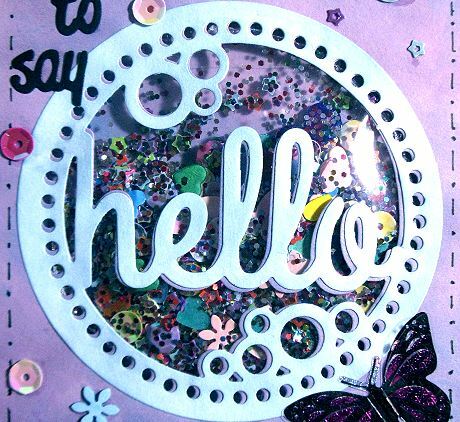 Il frame "Hallo" è brand "Creative Dies", tagliato due volte con la mia Big Shot manuale (quello esterno azzurro è tagliato interamente, l'altro è solo un "buco" nella base della card). Lo sfondo l'ho colorato con i D.I. Tumbled Glass e Milled Lavender e gocce d'acqua. Ho stondato i bordi e con un pennarello sottile ho disegnato il doodling nero tutto attorno. La farfalla è uno sticker metallizzato, mentre tutto intorno alla base della card ho attaccato del washi tape. ...Volevo aggiungere solo due o tre paillette intorno alla finestra, ma come sempre mi sembravano poche... e così anche stavolta niente CAS LOL :D e la card finita è troppo "affollata" :) Ma non mi arrabbio... Mi sono divertita, questo è l'importante. Il sentiment "Just to say" è una fustellata di carta nera fatta con un set di fustelle trovato in una rivista (e la Big Shot). Ho usato un pezzetto di una busta di plastica da ufficio, ritagliando il contorno di quello che avrebbe dovuto essere un cerchio, poi ho sigillato i bordi lasciando uno spazio aperto. Ci ho versato dentro un po' di glitter, alcune paillette che ho avuto da Milka (Grazie!) e altre minuscole paillette a forma di stellina bucata, poi piccolissimi fiorellini e cuoricini di carta (leftovers di tagli con un punch per bordi). Ho chiuso l'apertura del cerchio di plastica e l'ho incollato al centro della finestra nella card usando semplice scotch. Ho messo del foam biadesivo sugli angoli della card per uniformare lo spessore e ho chiuso il cartoncino, che avevo già piegato a metà. Ho incollato sopra alla card la fustellata azzurra, per dare contrasto e un po' di dimensione. Fabulous storage, such a good idea. A super shaker card, lovely colours - so pretty. Amazing shaker card. I love all your detailing. You have nearly all the elements on there. Your idea for storing your die cuts is a perfect solution. I have done that with all my stamps and dies . So much easier to see them all. Thankyou for coming and spinning the wheel this week. Hugs Mrs A.
Hai fatto proprio un gran bel lavoro!!!! Ero entusiasta di averlo e già pregustavo i mille utilizzi, invece non è così, purtroppo!!! Comunque questa idea mi potrà tornare molto utile!!! BRAVA!!!!! Beautiful storage and great shaker card. 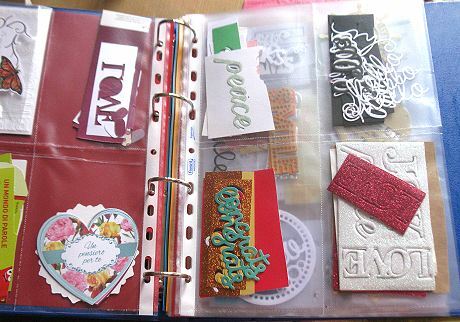 Super way to organise your stash Alice, it gets so frustrating trying to find dies and stamps, well done. Lovely shaker card! Great idea and so pretty to use the washi to make the background. Perfect storage solution idea! How clever to create your own 'pockets' using the fuse tool! That is just a brilliant storage idea. I love the shaker card you've done with the fuse tool, too. (My fuse tool is a NBUS, so my hat's off to you for being brave enough to use yours!) I expect you'll feel a lot more comfortable with it, as you use it more often, but I think you did just splendidly with your first efforts. And all the little bits you've put in the 'window' really grab the eye. Good job! TFS & Hugs. Happy Easter. Just wanted to pop over and say thank you so much for the lovely comments you left on my blog! 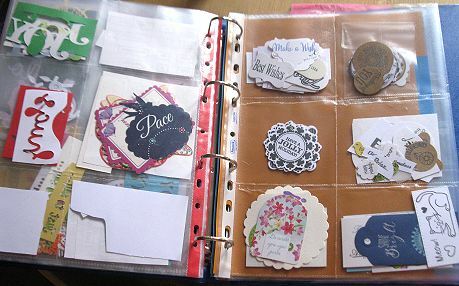 Love your storage idea for housing all your die cut shapes - I use a CD wallet to store my dies on magnetic sheets in the same way...though I had to buy another one the other day as mine is getting so full...not that I have too many, of course?! 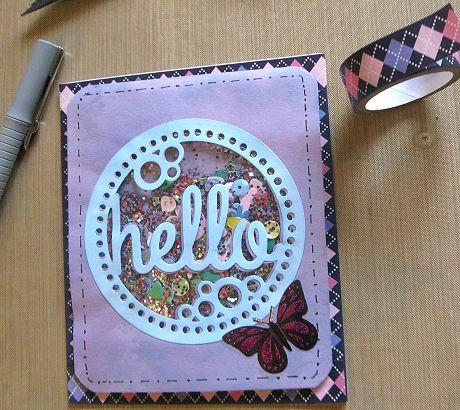 Great shaker card, thanks for sharing your creation with us at Creatalicious. We hope to see you back again. Hello, dear Alice! This is so impressive, my friend! 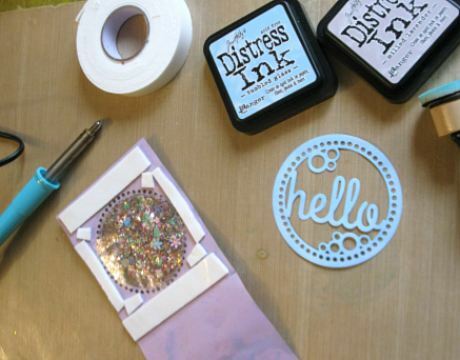 What an awesome way to organize all of your die-cuts! Brilliant idea to use your fuse tool to customize the sizes of the pockets to accommodate your needs. Now everything is at a glance and easy to find! I love your shaker card too! Yes, you had a CAS card but kept going - I do that too hehe! It's fun to keep adding details! It's okay, my friend. Go with your own style, CAS or not, because it is beautiful! And congrats on your win over at Brenda's blog! Yay! I was so happy to see your name! Great organisation, Alice, and your card is stunning! Kisses, my friend. OH Alice, this is beautiful! What a great way to showcase the scraps! I have a similiar album with clear pockets for smaller stamps! They keep falling all into the storage bin and the clear pockets (large) were too big - the result, a binder ! perfect! Fabulous organisation. I am always planning to do this but never seem to get to it so I always have to sort through everything. Maybe I should try this. Love your shaker card, looks wonderful, I have used the Fuse tool a couple of times but Im not very confident with it. Still learning. That fuse tool is a great idea and will have many uses!Love the idea of using it for a shaker card. Looks fabulous - you are too hard on yourself. 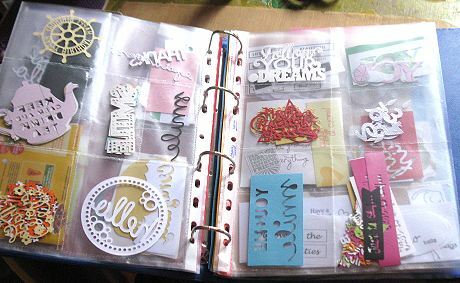 Yes,I too hoard things and run out of space so the idea of folders calls to me....when I can get some time to do it! You commented on my ribbon stash - that is only half of it! Lots of it elsewhere and yes, Weasley has discovered most of it! I keep my leftover pieces in clear plastic bags and paper scraps in big boxes. I’ve given up being more organized, but I admire your tidiness. I love shaker cards and your mix looks great. Sparkly and colorful! Well done, Alice, I’ve sued a similar method for organising my China dies too. Great hullo shaker card too. A really lovely card and love the pretty shaker element. 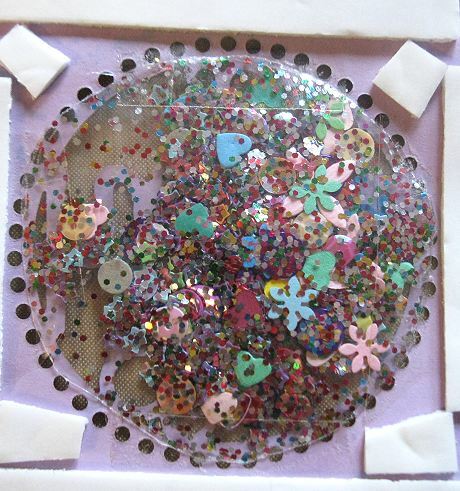 Thanks for joining in with our Spring challenge at That's Crafty! and wishing you luck. What a gorgeous card! I love the idea to use washi tape on the edges to create a design for the back panel!! 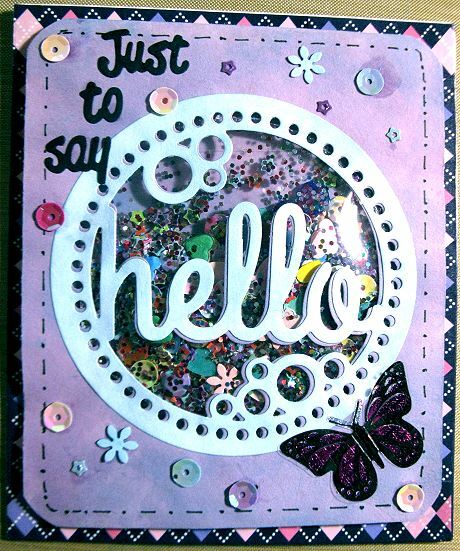 The shaker design is so wonderful, I love all your sequins and the hello window! What a genius idea for storing your extra or pre-cut die pieces! I love how you can skim though it and instantly see what you have ready that can be used on your project. 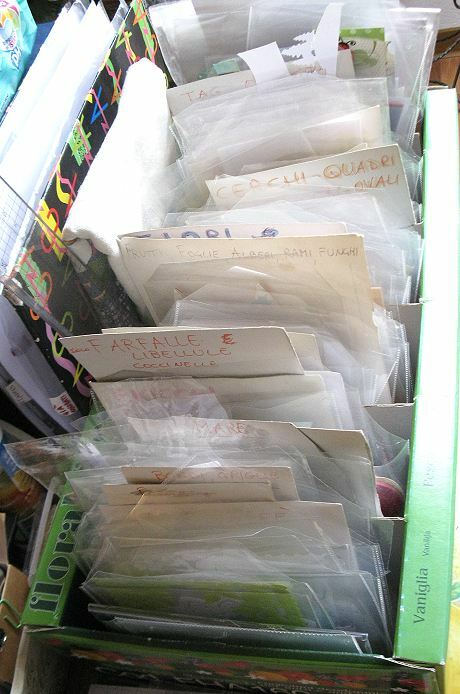 I currently use photo cases that I put labels on, but I have to sift through the case to find what I want and quite often they rip because they are all stuck together! I may invest in something like this, thank you so much for the inspiration! !